February is most notably marked as the month of love thanks to Valentine’s Day, but it’s also American Heart Month. According to the CDC, “Heart disease is the leading cause of death for men and women in the United States. 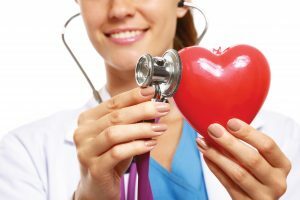 Every year, 1 in 4 deaths are caused by heart disease.” The good news is with early intervention heart disease can often be prevented or reversed with the help of a balanced diet, exercise, and Bioidentical Hormone Replacement Therapy (BHRT). As we’ve mentioned previously, hormones play a vital role in one’s heart health. According to the American Heart Association, an overall increase in heart attacks among women is seen about 10 years after menopause. The rationale behind this is that women lose the hormone Estradiol post-menopause that runs abundant prior to menopause. Estradiol is an important component to cardiovascular health because of its cholesterol regulating properties as well as supporting artery dilatation and pliability. Hormone Replacement Therapy is a great way to prevent heart disease, but only if “natural” bioidentical hormones versus synthetic hormones are used. Another important component is the method with which these hormones are delivered. The best method is via Pellet therapy, whereby hormones (both Estradiol and Testosterone) are delivered directly to the blood stream. The combination of bioidentical hormones and our superior delivery method provides the same heart-protective benefits a woman experiences prior to the onset of menopause. Hormone replacement therapy has been found to have the biggest impact for women in their 40’s who elect to start our therapy prior to entering menopause. To learn more about hormone replacement therapy or to start your journey in to “wellness” call us today at 201-225-2525.